We are a nation of immigrants. Most of us descend from others who came to this land whether by their own volition or against their will. With this in mind, I will be documenting all the known immigrant ancestors for both my family and my spouse’s family. This is fifth installment of this series. 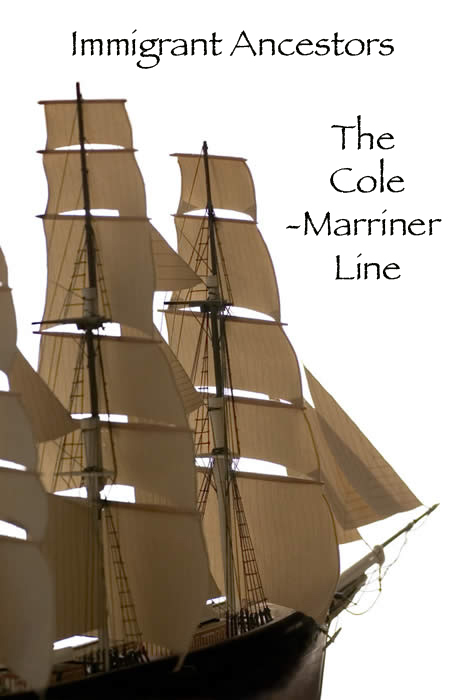 Finally, I have come to the last line of my family, my mother’s maternal family, the Cole–Marriner line. We are a nation of immigrants. Most of us descend from others who came to this land whether by their own volition or against their will. With this in mind, I will be documenting all the known immigrant ancestors for both my family and my spouse’s family. This is fourth installment of this series. Now that the Watts immigrants ancestors have been documented in my previous post, let’s move onto the second half of the Watts-Stark line. Next up in my quest to identify my maternal grandfather’s immigrant ancestors is the Stark line. We are a nation of immigrants. Most of us descend from others who came to this land whether by their own volition or against their will. With this in mind, I will be documenting all the known immigrant ancestors for both my family and my spouse’s family. This is third installment of this series. Next up in my quest for identifying immigrant ancestors are the predecessors of my maternal grandfather. However, with the sheer number of known immigrants in his lineage, I have decided to divide up the Watts-Stark line, focusing on just the Watts forebearers in this installment and the Stark progenitors in the next post. We are a nation of immigrants. Most of us descend from others who came to this land whether by their own volition or against their will. With this in mind, I will be documenting all the known immigrant ancestors for both my family and my spouse’s family. This is second installment of this series. The next immigrant ancestors I shall chronicle are the predecessors of my paternal grandmother, Betty Lee Noell: the Noel-Ardinger family. We are a nation of immigrants. Most of us descend from others who came to this land whether by their own volition or against their will. With this in mind, I will be documenting all the known immigrant ancestors for both my family and my spouse’s family. This is first installment of this series. Imagine my surprise when I started to search for the immigrant ancestors of my paternal grandfather, Carl Victor Taylor, Jr. (the Taylor–Thomas family). With the surname Taylor, it is guaranteed that he has at least a few (okay, more than a few) British ancestors. However, after much effort through the many English surnames from that side, I was unable to determine his English immigrants. As most British lines in America extend back to the founding of this country, it is understandable.